In October 2014, the first ever CreativeMornings Summit was born, welcoming over 175 organizers and their CreativeMornings teams from 65 cities around the world to Brooklyn for a week of inspiring talks, creative seminars, and long-lasting friendships. Event space decor for the summit was colorful, fun and full of life. My goal was to make our sponsors feel special, and make their logos feel more than just a sponsor tag. I hand-painted and constructed a series of six canvas flags for each of our global summit sponsors: Mail Chimp, ShutterStock, SquareSpace, Moo, Blue Bottle Coffee, and SixPoint Brewery. 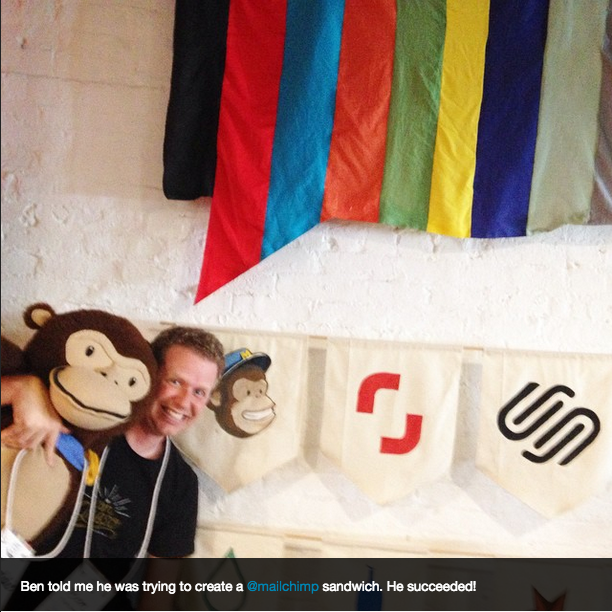 I also sewed a huge CreativeMornings logo flag. Thank you CMNYC team for inviting me to work on this amazing project. If you haven't seen a CreativeMornings talk yet, find one in your city and sign up ASAP!